News Archives | ShopWare Inc.
Manufacturing news you can use! Check out article below on how one of ShopWare’s customers used advancements in Mastercam to improve their shop. Shopware expands to Indiana and Kentucky! ELGIN, Illinois – Shopware, a Mastercam reseller for over 25 years, is proud to announce our territory expansion into Indiana and Western Kentucky. The recent acquisition of CAD/CAM Technologies (CCT) will allow Shopware to provide Mastercam sales and support to users in this area. The acquisition makes Shopware the largest Mastercam Value-Added-Reseller in the U.S. We welcome all the customers in Indiana and Kentucky and look forward to expanding on the world class service and support you’ve seen from CCT. Shopware will also begin selling and servicing ProShop Shop Management software in Indiana & Kentucky. Founded in 1992, Shopware is a Value-Added-Reseller of industry-leading solutions for manufacturing. The company’s experienced team of industry professionals offer real-world, hands-on expertise in implementing a wide variety of solutions, including the full suite of MASTERCAM software products, and ProShop ERP. Shopware provides MASTERCAM and ProShop training, installation, support and maintenance services. Do you want to be a Top Shop? Paul Van Metre, co-founder of ProShop Software and former owner of a top CNC shop, explains how you can transform your business using a System to turn your business into a Franchise Model whether or not you want to open additional shops. A Franchise Model provides predictable consistent value through documentation and order. It allows for the lowest possible level of skill and eliminates tribal knowledge. Work on your business – not in it. Shopware attended and exhibited at the inaugural Top Shops Conference in Indianapolis earlier this month. It is put on by magazine publisher and media company Modern Machine Shop. The conference’s focus is to review data from their annual survey (this year 350 shops submitted) and determine what makes a shop a Top Shop. 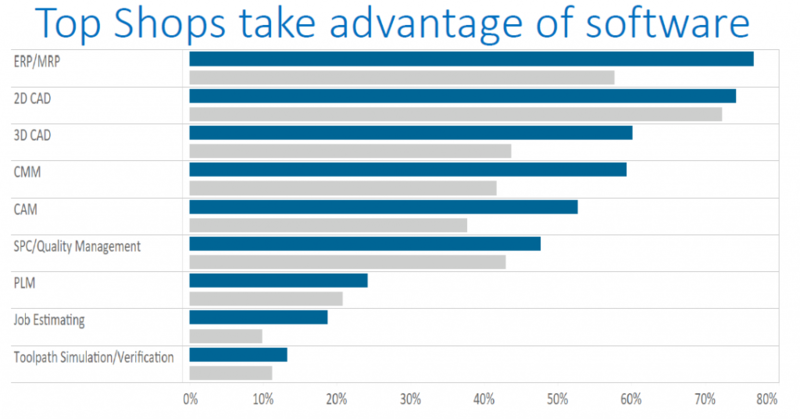 Shops get to see how they stack up to their industry counterparts while seeing the technologies, strategies, and processes that leading companies are applying. Beyond the survey data and analysis presented by MMS, attendees get to hear speakers and see curated vendors. MMS did a great job of focusing the content and vendors on showcasing leading edge strategy and technology. 1. If you have a CNC machine shop you should be at this conference. Not only is the benchmarking important, but you’d be doing your business a disservice if you’re not considering the technology, processes, and strategies that the top shops are using. 2. Cutting tool strategy is a major indicator of shop performance. Top Shops spend more on people, equipment, and tooling – but there is a larger discrepancy in the amount spent on tooling between Top Shops and the rest. 3. 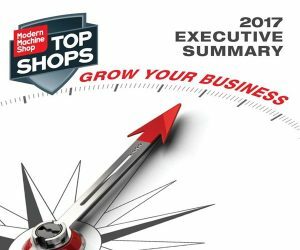 The Top Shops report opens with the importance of having an ERP/Shop Management Software. If you can’t understand your costs you can’t possibly hope to be a Top Shop. It was nice learning that shop management software was even more important for our customers than we even imagined going into the conference. We are already looking forward to Top Shops 2018, which will take place Sept. 13th at IMTS 2018. You know us as the local distributor of Mastercam. That won’t change, but we’ve decided to add another world-class product that we will begin selling, training, and supporting. We’ve hired additional, separate staff for this product so your best-in-class Mastercam support will continue. ProShop is the best shop management software we’ve come across and it is a perfect complement to Mastercam and the customer base we have. It’s is more than ERP software. It is more than MES and QMS software. It’s an innovative new way to manage every aspect of your front office and shop floor so you can make the right decisions to maximize performance & profits. Developed over the course of nearly 20 years on the shop floor of a CNC machine shop, ProShop was built by a manufacturer for manufacturers. ProShop completely integrates a robust and proven ISO-9001 and AS9100 certified Quality Management System. In our research leading up to the decision to represent ProShop we heard the horror stories of implementing this type of software – that won’t be the case with ProShop – they have a track record of 30-day implementation. Check out all the modules included to manage each aspect of your business. See reviews on the software comparison site Capterra. Please ask us for a Demo today to see the fundamental improvements ProShop can bring your business. We only represent the best manufacturing solutions and you can expect the same level of integration and support from our team with this product.